Whether you have an iPhone or an iPod touch, it’s safe to say that Apple’s mobile devices are many things to many people. But the one thing they are to all their owners are great, customizable diversion devices. Certainly, both the iPhone and the touch have size-related limitations, which we rarely think of, because these are what make iPods intensely personal, to the point where they can almost feel like extensions of ourselves. But as all parents know, those other extensions of ourselves—our kids—often care little about such boundaries. This is especially true of the little ones—those least likely to have their own iPods. Which means if it hasn’t happened yet, it will soon. You’ll find yourself handing your device over, if only to coax just five more minutes of patience from your mini-me at the post office, the grocery checkout line, or the airport. Which is why it’s probably a good idea to purchase a few good kids games for your iPod. I took a look at three ipod games for kids (with the assistance of my very cute-but-savvy seven- year-old daughter), and found all three quite capable of providing an immediate, compelling diversion. And one, Disney Fairies Fly, turned out to be much more. Disney Fairies Fly, from Disney is a lush, animated game in which you take the role of one of six fairies (Tinker Bell, Iridessa, Silvermist, Rosetta, Fawn, and a surprise fairy) and fly through any of five unique “worlds.” The goal of each flight is to collect as many “pick ups” (flowers, apples, acorns, diamonds, pearls, and so on) and as much fairy dust as possible, while avoiding obstacles and objects such as birds, bees, bats, tall grass, dead trees, and thunderstorms. Each of the five worlds has three levels of difficulty, (as your skill improves, you fly faster and face more obstacles) and at each level, the goal is to fly through the landscape and collect as many pick ups as possible before you run out of fairy dust, which is your basic fuel. You unlock each subsequent level by reaching the end of a part of the landscape; after you unlock all three levels of the one landscape, another landscape opens up to you. When you’ve flown through all five landscapes on all three levels, the surprise fairy is revealed and available for you to fly with. As you continue game play from there, obstacles become increasingly difficult to evade. You can “dash” to fly quickly by holding down a button in the lower right hand corner. There’s a red bar next to the dash button; once it’s drained, you have to wait for it to refill to be able to dash again. You also need to pick up additional pixie dust during your journey to keep going. You lose pixie dust when you run into obstacles or objects. The point of gathering “pick ups” is to score points. Flying takes some practice, as well as good focus and wrist action. Disney makes good use of the built-in accelerometer; you can move up and down by tilting the iPhone or iPod touch toward and away from your body; you naturally fly forward, and can “dash” by filling up the red juice bar on the bottom right of the screen. Dashing enables you to dodge some obstacles more quickly, or to quickly maneuver through portions of the landscape that feature few pickups in order to reach the more fertile portions of the sky, where there are pickups galore. Some pickups are worth more than others—for example, in the autumn landscape, green apples are worth 10 points, red are worth 20, and prized purples are worth 30. The more a pick up’s worth, the rarer—and better protected by obstacles—it is. The game features pleasant background music from the Tinker Bell movie, and the graphics are simply stunning, as you’d expect from Disney. My 7-year-old daughter enjoyed the game immensely—as she explains below—and seemed to become addicted to it. It wasn’t clear to me why, until I began play myself, and found that many levels, and many opportunities to “try again” (you never really “lose” in the land of Disney) are almost irresistible. The game should appeal to younger children as well; many of the user-posted reviews on the App Store report that 4- and 5-year olds like the game. Many of those same reviews also complain that the game frequently crashes, but I experienced only two crashes in several hours of gameplay. Disney does suggest on the App Store page, to reboot the iPhone “before flying with Tinker Bell and her friends.” This indicates that the developer is aware of some problems. And perhaps they’ve been largely fixed—I tested version 1.02, the most recent, and many frustrated reviewers had been running earlier versions. 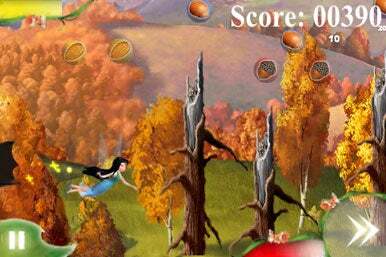 Disney Fairies Fly is an engaging game with splendid graphics. It’s worth the price, and if it’s a hint of what’s to come from Disney on the iPhone and iPod Touch, I’m looking forward to its next release. My daughter loves to play dress-up games on the Web. There are plenty of sites that offer free games which enable you to dress up a variety of models in a myriad of clothes, shoes, and accessories. The games are simple, and usually offer a huge virtual wardrobe. The fun is in the mixing and matching, and also in the ability to view an enormous collection of potential outfits all at once. Fashion Don’ts: A hideously dressed Suzy Dress Up stands poised, ready for change. The six icons on each side of the screen represent the many possibilities. The latter is what you can’t do with Suzy Dress Up, and it’s a drawback—though not a big enough one to keep my daughter from playing for a half hour or so before losing interest. What she discovered, on her second go-round with 3DAL’s game, is that because of the (literally) billions of possible combinations, you can create some truly garish looks, which she delighted in showing me. Thus she converted the game’s major drawback—you can’t look at an entire wardrobe and imagine how things will go together—into a positive, by seeing just how ugly things can get when you can’t quite imagine the possibilities. You can change 12 of Suzy’s wardrobe items or characteristics: her hairstyle (26 possibilities), eyestyle (22), mouthstyle (19), head covering (17), eyeglasses (15), tops (29), skirt or pants (38), footwear (23), hand accessory (bags, pom poms, fans, even a broom)(33), belt/necklace combinations (14), and skin tone and angel wing combinations (21). Even Suzy’s pet can be selected, Paris Hilton-style, as an accessory. The 14 possible pet accoutrements include a pig, a ladybug, and a snowman in addition to the traditional cat and dog. Suzy Dress Up only enables you to go through each type of item in a serial fashion, and there’s no option to set aside different possibilities (say, on a virtual set of hangers). This would be a welcome addition to this or another dress-up game. One of the more fun aspects of Web-based dress up games for my daughter is also the capability to print out color images of your creation. While you can take a screenshot of any Suzy Dress Up combo that you wish by pressing the off and home page button simultaneously, this is not at all intuitive, nor immediate. (To access your shots, you have to sync your iPod touch or iPhone and view and manipulate the photos in iPhoto.) An on-screen “snapshot” button would be a terrific addition to future versions of this game, as would the ability to create a photo album. Suzy Dress Up is an entertaining casual game, priced appropriately. Although it’s not as engaging as Web-based dress up games my daughter has played with, it’s a nice, appropriately priced option for the iPod touch or iPhone. Bee Careful: If the girl in ButterflyCatch snags the bee in her net by mistake, she’s out 500 points. ButterflyCatch is a twitchy-thumb game from Corey Ledin with a few simple graphics and a couple of repetitive moves. The main character is a girl in a park, and she’s wearing roller skates while clutching a butterfly net. She can roll back and forth between the left and right sides of the screen; when she reaches one side, she bounces off and turns around. You can control her speed; the more you tilt the iPod, the faster she goes. You can make the girl jump by pushing a button on the bottom right corner of the screen, and make her lift and wave the butterfly net by pressing another on the bottom left. The faster she skates, the higher she can jump, and hence the more butterflies she can catch. But while she’s catching butterflies, she’s also evading a small dog—if she doesn’t jump over the dog, she gets bit and the game’s over. Meanwhile, there are bees mixed in with the butterflies; catching butterflies gains you at least a few hundred points each, but catching a bee decreases your point total by 500. The point of the game is to score as man points as possible, and if you want, you can upload your score to the Web and compare your score to that of other ButterflyCatch players. My daughter disliked this game immediately, and even after I urged (read: bribed) her to try again, she continued to show little interest. The game’s variations and challenges are too few, and it’s easy to imagine improvements (more obstacles besides one dog, more bad things to catch besides bees, more scenery, and so on). While it’s a challenge to control the girl’s speed, jumping, and catching abilities simultaneously, the potential reward (more points, more of the same game at the same level) didn’t seem worth the trouble. This said, the game may be more amusing for children younger than seven. All three games are compatible with both the iPhone and iPod touch. Disney Fairies Fly is compatible with the iPhone 2.1 software update, while Suzy Dress Up runs on the 2.x software, and ButterflyCatch requires the 2.2 update.